Leasing & Floor PlansView our options. Contact UsWe are here to help. Our 1-Bedroom units have open floor plans, with a master bedroom suite, large living room and kitchen with breakfast bar. These units offer plenty of closet space with a big walk-in closet in the bedroom and additional closet next to the front door. Plus, you get a 14-foot balcony or patio off the living room – terrific for sunbathing, grilling or relaxing with a good book. 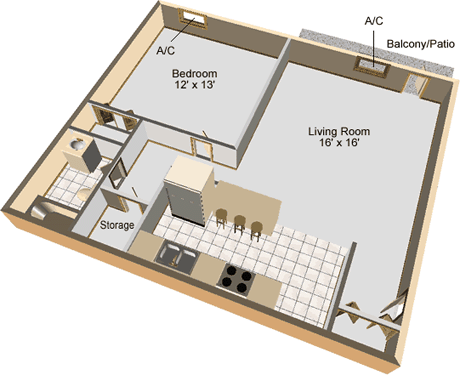 If you like the sound of this but may want a little more space, check out our Deluxe 1-Bedroom Apartment. Our Deluxe 1-Bedroom units offer extra space with a larger bedroom and the addition of a storage area right inside your apartment – great for keeping sports equipment, off season clothes and linens. Of course, you still get the spacious, open set up of our regular 1-Bedroom units with a large living room, kitchen with breakfast bar, closets in the bedroom and near the entrance way and a 14-foot balcony or patio off the living room. 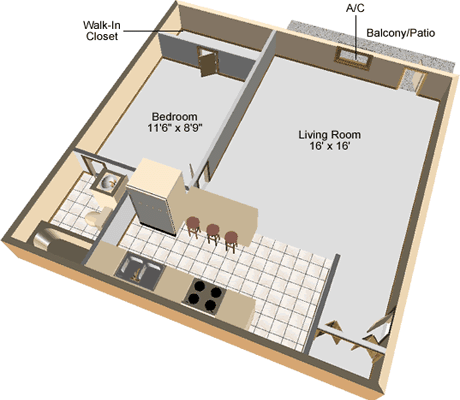 In addition, the layout of these units puts the bathroom door in the hallway so your guests don’t have to go through your bedroom to get there. If you like the sound of our Deluxe 1-Bedroom apartment but may want a little more space, check out our 2-Bedroom Apartment.